Kate, can you share with us your background before yoga? Before practicing yoga, I was a field hockey player in high school, and a student of West African dance in college at UNH. I became a vegetarian at age 16 for “environmental reasons” and began studying buddhism and philosophy at home. I began yoga by accident on a semester abroad in India (with Karen Haberman in Auroville) and ceased all other activities, returning to India immediately after graduating with a degree in creative writing. I maintained a 4.0 after what I had seen traveling in India, now knowing the great privilege it was to be at university. I never had a career, or long term job before dedicating my lifestyle to yoga. I worked in natural foods stores and cafes during high school and college, and later to fund trips to Mysore. This question is funny to me, because my background before yoga was only my teen-age years, and everything immediately took on a different hue at age 20 when I began the practice. 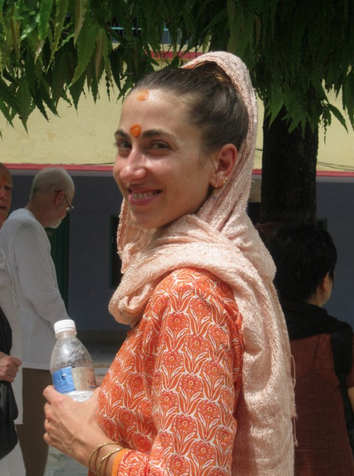 How did visiting India help form your understanding of yoga? There are so many aspects of the yoga that are Indian in nature. The way all of the arts are taught- be it yoga, martial arts, or music, is always as Guruji would say “one by one. slowly slowly.” The progress oriented nature of western education is thwarted by the specific method of learning yoga. Pushing goes nowhere. Surrender takes you all the way. The sense of humor in the shala, especially about pain; the way attachment to “my body” is approached not as something to be coddled, but as something to get over; these are all Indian attitudes to me. Then there is that thing which can’t be named, a mystical dimension that is alive in India. You feel it right away. I absorbed these aspects of the yoga naturally by being immersed in the environment. I am so grateful for that. What was it about the practice that initially drew you in? The matter of how challenging the practice was is what hooked me. The teacher said to me, in resting pose at the end, “you are all crooked!” and I thought, whoa man I need to do more of this. I made that decision, and as was my way in most things, I set about over-doing it completely. Other physical activities melted away and there was only yoga and finishing college. 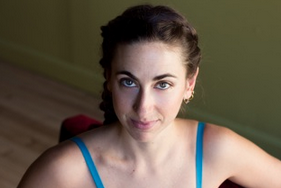 Can you elaborate on the complementary nature of Ayurveda and Ashtanga yoga? Practicing in Mysore, so many Ayurvedic routines were seamlessly ingrained, such as his occasional dietary recommendations, saturday castor oil bath, and consistency of daily practice. Yoga and Ayurveda both stem from the Sankhya system of philosophy, one of the Shat Darshan. It’s the same order of the universe, and the same understanding of the natural movements of Prana which underlie both. Each science aims for deeper knowledge of Self and union with the whole. Yoga appears in Ayurveda as a modality for spiritual as well as physiological therapy. I see a complement in the two as Ayurveda supports the householder in maintaining health and managing the duties of daily life, while Yoga holds particular possibilities for human evolution. These are two aspects of the life devoted Ashtangis are constantly working to balance. The importance of the duties of daily life is something Guruji, and now Sharath, have always stressed for those of us who would rather simply practice yoga only. That has been a very valuable teaching for me. I once told Guruji I was sick of cleaning houses for money on Maui and asked him where I should go and what I should do. Many houses are there! Get to work Kate. It was one of the best of lessons, and the study of Ayurveda has helped me balance of working, practicing, and teaching- and to help students do the same. Kate, you said that being in India you were able to absorb ineffable aspects of the yoga naturally by being immersed in the environment. How did you integrate these qualities to your practice and teaching back in the US? Good question. Integrating the ineffable aspects of the yoga into teaching and practice back in the states was not easy, and is always going on. Puja: I would seek out Robert Moses (editor of Namarupa magazine) when I came back to the states and spend a little time with he and family. Their living room looked like a temple, they cooked Indian food, and listened to Indian music. He taught me a few basic puja practices. Chanting, ringing the bell, and making some humble offering, every day, kept me connected to myself as a spiritual being, whatever the day might bring. Sangha: Upon returning to the states, I would take care to land myself in a place where like-minded community was available. As I eventually committed to holding a Mysore room in Boston, that room became my lifeline, and often the only place I felt at home after time in India. Travel: In the end, it was the old back-and-forth to India that I credit for true integration. When one keeps shifting cultures annually, Reality begins to encompass more than just what we see in front of us. It is hard to forget there are different ways of being and meanings to things when the vantage point keeps changing. A room full of students becomes this garden of unique creatures evolving. How do you help your Western students embody concepts like surrendering or non-attachment to the body? Consciousness on the breath is a natural way to take us deeper into the experience of the body, where surrender and non-attachment lie. External alignment cues, while helpful to avoid injury, can be overused to the point of fostering attachment to the gross aspects of the body that then takes some work to release. I come back to Guruji’s most common verbal instruction: free breathing. I remind students that this is a breathing practice, the breath is breathing you, and one must practice directing the attention to the realm of breath. Breath awareness requires a surrendering of the mind. This will lead to non-attachment. It is obvious from your answers that you will embrace the lessons imparted from Guruji life-long. Can you talk about how you came to study with him and please describe what that experience was like? I had been practicing with old students of Guruji already for 5 years before I came to Mysore in 2003. I first practiced with Guruji and Sharath in NYC with some 100 others. I was absolutely shocked when he walked into the room and I began to cry. Not a cryer! I was overcome with gratitude to this individual who had made it possible for me to know something like this practice in my lifetime. I lined up to touch his feet after practice, and I was so high I just gave him this crazy smile, and he looked at me and chuckled as though he could appreciate my brand of crazy. I was in Mysore a year later. He always had a grandpa energy with me, never scary or strict. Sharath, now that’s another story. Guruji was pretty old then, and I used to wear bright red pants and I swear he recognized me by the pant. He would come barreling across the room for backbending. Other times, he would kind of waddle through the throngs of practitioners, using butts up in downward dogs for support. I remember laughing a lot. We all just loved him. Kate, any final thoughts to readers on the practice? As a parting thought, I would bring the attention back to Gratitude. It has always been important for me to remember giving thanks for the opportunity to practice. Asana is the fun part, and so easily the mind can make daily practice into a drudgery, or an “I’m not good enough. I’m injured. I’m tired.” What a misconception. How lucky we are to practice at all, any amount.